Hey everyone! Summer has ended for most of you + I have not shared a thing (minus my instagram) with you guys. This summer has been one of change. We moved from NC to Texas, we've adjusted to post-dental school life, full-time freelance life, and Eloise, well, she's still a nut. Let's just say life, while full of so many things to be grateful for, became rather crazy. So via photos, and quick blurbs I'm going to go through our trials, tribulations, + exaltations of the summer of 2016. Jerry graduated dental school and is officially Dr. Allen. I finished the first installment of my Duke Kunshan University VR experience. 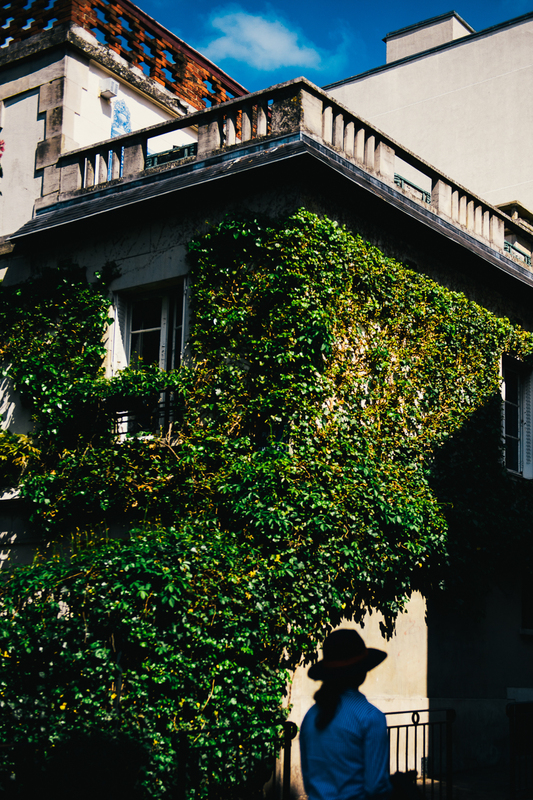 We ate our way through Paris. I shot a story on sweet tea with the even-sweeter-than-sweet-tea Sheri Castle for The Local Palate. We started packing up our humble apartment in Chapel Hill for the sweltering, cosmopolitan concrete jungle of Dallas. P.S. There's a Youtube 360 video at the end of riding bikes through Paris if you want to see me acting like a fool. June + July's adventure's are up next! Simplicity is my destination. I think it will take me my whole life to get there. But it is a blessing to have reminders of it throughout my life. From taking in the golden light as it spills through sunflowers, to exploring all sorts of fantastical places with people you love, and eating fresh meals, I think being whole + happy stems from experiencing + appreciating the simple joys of life. 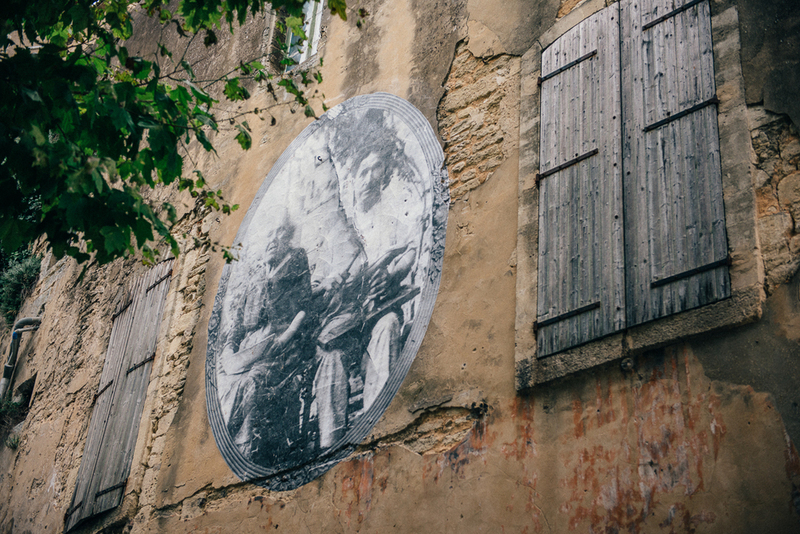 One of my favorite street artists, JR teamed up with documentarian + filmmaker Agnes Varda in their project JRxAgnesVarda to tell stories of the people of Provence. JR is known for his huge pastings of portraits across the globe on buildings and grounds. His mantra is to share with the world his art, aiming to attract unexpected viewers + create social awareness about identity. His most recognizable project is the Inside Out, which has graced even our small town of Chapel Hill. Small towns are not forgotten by JR, as he has photos of Bonnieux locals pasted in the center of the village. Our favorite boutique owner, Natalie sits on a ledge with her star-studded dress + umbrella. An old family photo graces the square of Le Fournil, and the postman is larger than life on the market square. Halfway through our trip, my loving husband decided to jump on a plane to surprise me. I had been away from him for about 3 weeks and missed Jerry's face dearly. He surprised the mess out of me + somehow kept it secret for almost 2 months! Of course, his showing up meant I finally had a driver to let me explore all the places solely for a photo. Life is much better when I can travel with this smiley fool. Ansouis is a small village known for 3 things. Ice cream, it's simple parish, and it's Musée Extraordinaire, which showcases a man's love for diving + art. 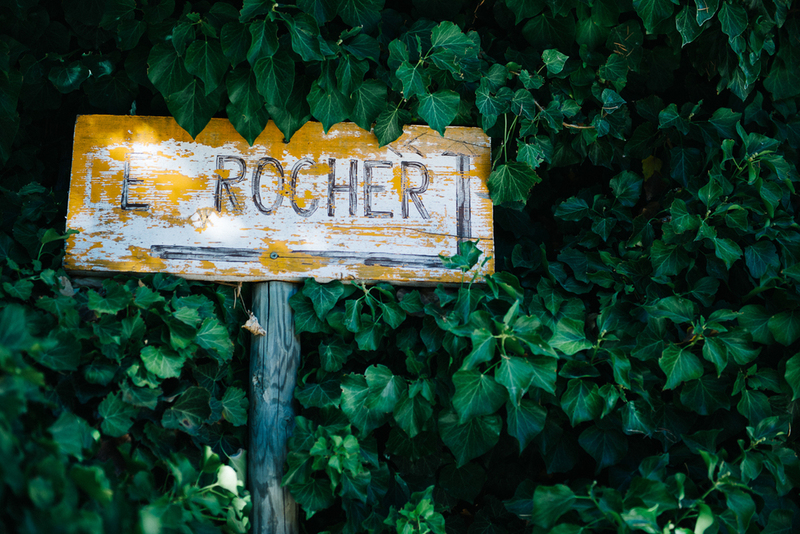 The ochre hills of Roussillon was one of our last explorations. The red, sandy hills were stunning...and a perfect sandbox. One of the loveliest parts about going to Bonnieux this year was meeting up with all our friends we met last year. Robbie +Nava were so hospitable showing us around antique markets and we treated them to a home-cooked meal. Our last night in Bonnieux, we drove to Lacoste to have a very un-French aperitif with Ruth, her lovely and super fun family, and new friends and featured artists in the new SCAD Atelier program. I met Ruth last year at her pop-up shop for her gorgeous jewelry + antique textiles just before she closed up...and I'm so thankful this encounter happened! 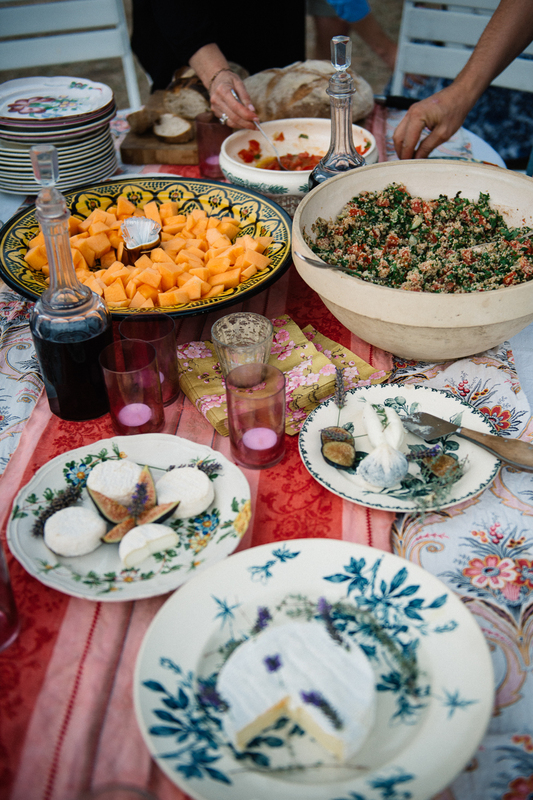 Ruth went to pick fresh melon for her aperitif, made tabouleh, bruschetta, and had a lovely array of cheeses that her son, Louis, decorated ever so precisely with lavender sprigs. We ate, drank, hunted for treasure with Louis + Charlotte, claimed our baguettes, reveled in homemade creme brûlée + chocolate soufflé, and watched Louis + Raph blow fire. We finished our evening late into the night talking about our love of art, antiques, UFOs, + Simon & Garfunkel, while sipping on the finest boxed Cave de Bonnieux wine. This lovely evening went straight into the clear + crisp provence night and continued as a styled shoot with the amazing Trish Andersen, Cecelia Elguero, + Michael-Birch Pierce the next day. Thank you, Ruth, for the hospitality, lively conversation, + collaboration opportunities. These photographs, while nothing spectacular are just about living well, mangez bien. They are friends, they are family, they are memories, + visual nostalgia. They are reminders to keep life simple, and savor every bit of it. These, as Louis would say, are my bits of treasure. Oh, Bonnieux. You're quickly becoming a second home. Your sweet cedars + blustery mistrals, your pure light + lively streets; Quickly, your simplicities taught me the meaning of living a slow life. Mangez bien, they say, eat well. To the French, eating well is equivalent to living well. And it's such an important part of their day-to-day life. Breaths of fresh air taken in between bites. 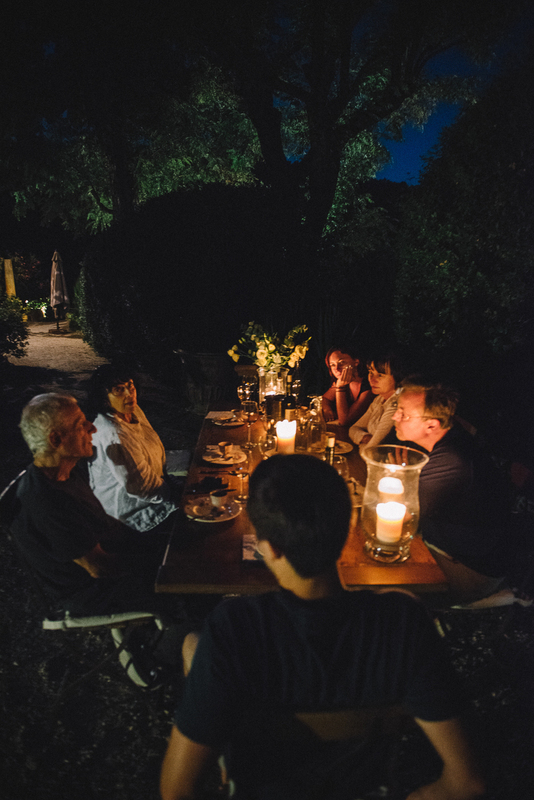 Laughter, conversation, and sips of wine fuel the meal as gusts of provençal air whip through your hair. Savory + sweet dissolve in your mouth as beautifully as the light falls on the faces, hills, and vineyards of Provence. Life is simple. Slow. And this year, I learned to appreciate the simplicity of it all. So here's to fresh spring water, snail shells on grass sprigs, breathtaking sunsets + dinner with folks who just enjoy presence. Our travels to Avignon brought with it the theatre festival. Posters adorned plane trees, medieval walls, and even people as they strolled through the streets. We found solace in the Basilique Saint-Pierre as the light literally poured itself into its atmosphere. This 7th century church, is quite understandably, the locals most adored. Saignon feels like the top of the world. 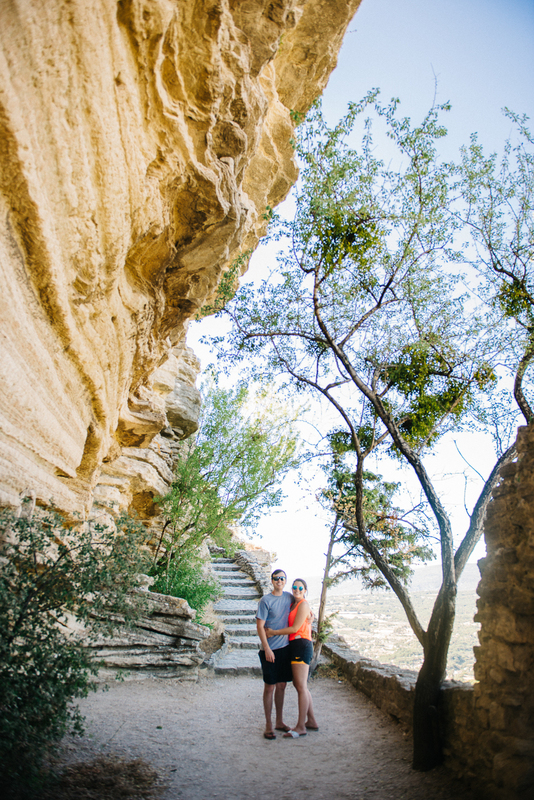 This fortress village's rock formation is one of the highest points in the Petít Luberon you can reach by foot. It's panoramic views are worth the feeling of getting blown away at the top. Seriously, eat a baguette before going up (added weight to keep you grounded), and truly take the time to just be. Bonnieux's friday market is one of my favorite. The people are real, the food is indescribable, + the atmosphere is charming. 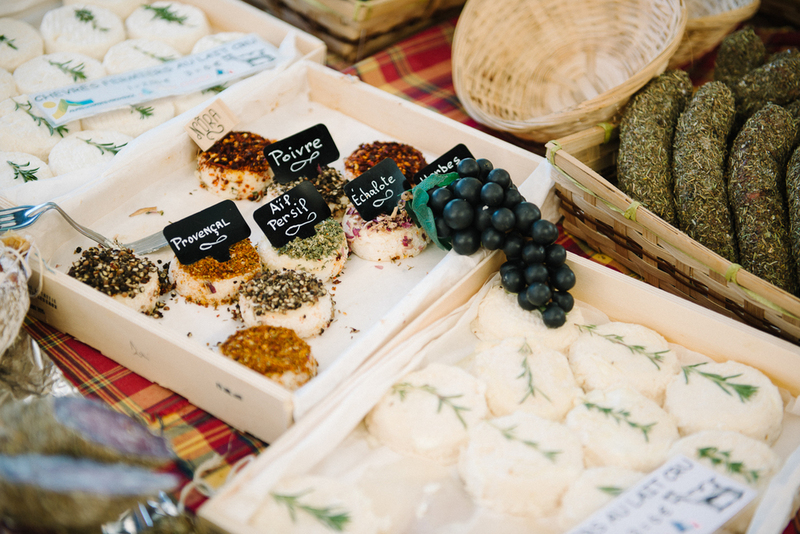 Part marché paysan, farmers' market, + part provençal goods, it's one of the local favorites; sitting in the cafe, sipping your espresso, + getting some solid people-watching in the books makes it even sweeter. Tess + I were put in charge of a meal. It was glorious...not to brag. Our entrée was a plate of 2 zucchini flowers, stuffed with a goat cheese mixture of honey, cayenne pepper, lemon, and lavender, and pan-fried in beer batter. Topped with fleur de sel, these savory indulgences were the epitome of treat. yo. self. Tess + Lauren's ratatouille. Rustic, real, + fresh. This rosemary spiced dish was full of squash, zucchini, heirloom tomatoes, artichoke, eggplant, fennel, potatoes, carrots, + haricots coated lightly in balsamic vinegar and generously with olive oil. Fish en papillote is my specialty. I love making it, mainly because there is little clean up. We unknowingly picked a finicky fish to cook, rougets, but the end product, seasoned with simple flavorings, was undeniably a favorite of the night. It's true, simplicity wins, every time. Our last course of the evening, was a Tess delicacy. Unabashedly simple, these nectarine tartlets were ever so sweetly covered in cane sugar + honey, served with a dollop of vanilla bean ice cream.